Merry Christmas! If you’re coming from the beautiful tour at A Thoughtful Place, welcome! So glad you’re here. 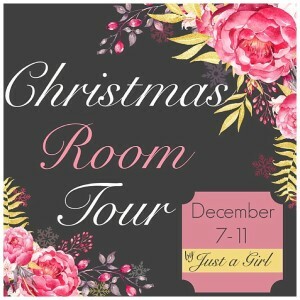 I’m excited to be part of Chris Carey’s Just a Girl Christmas Room Tour this year. 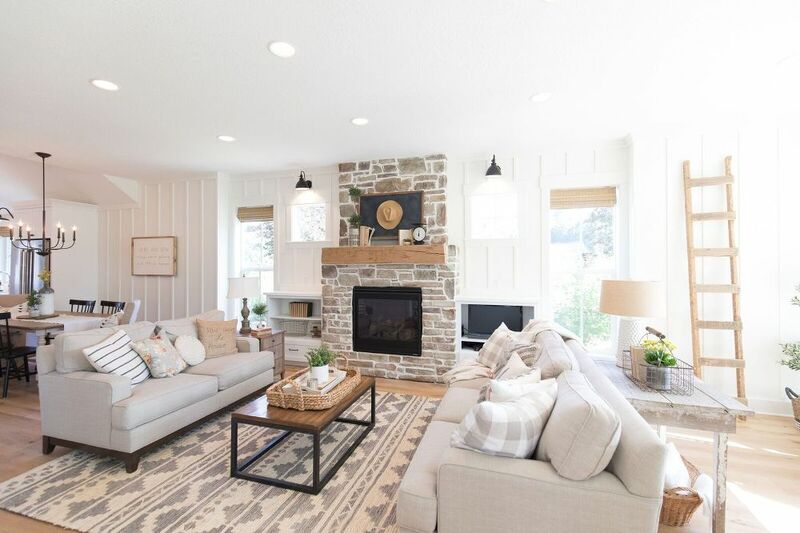 If you haven’t seen the rest of the homes on the tour yet, you’re in for a treat! WOW!!! Ok, let’s get to it! The room I chose for the tour is our great room/kitchen area…it’s all one big space, so I’m including the whole area. Come on in…let’s sit by the fire, drink hot chocolate, and chat! This Christmas season, I found myself incorporating a lot of “regular” stuff into the Christmas decor, to make it totally “us.” I was going for a casual, warm, inviting farmhouse Christmas. Neat and tidy spaces make me happy, and I’m not gonna lie, I’ve already had visions of how fun it will be to take down the holiday decor, ha ha. Don’t get me wrong, I absolutely LOVE Christmas. Christmas music, Christmas cookies, Christmas traditions, and OF COURSE, celebrating the reason for the season, Jesus! But a girl needs her space. So kick off your winter boots and I’ll show you what I came up with. I know. Can you see it? You might need to sit down for a sec. Yes, we have some RED in our house for the holidays. I’m a neutral loving girl, but after a few years of neutral trees, the red was begging to come back out. It’s just so Christmasy. And my daughter specially requested it. So, there’s that. Let’s talk about this tree. It’s called a “wild Noble.” We drove up into the hills to one of the only Christmas tree farms that grows these…the elevation makes them particularly sparse and gorgeous, if you like that sort of thing. Which we do. No, actually we LOVE that sort of thing. Like a lot. My hubby found the farm on Facebook and we were so excited when we arrived to see hundreds of trees out in the field…just waiting to be cut. It was pretty much dark by the time we arrived on that rainy Thursday night, but that almost made it more exciting. We found this beauty in about 5 minutes flat, and before I knew it, my husband and son were tying it to the top of our SUV. Once we arrived home, and got the tree into the light of the garage, we were relieved to see that our tree was just as beautiful as we thought it was, out in that dark field. Ok, and I just had to show you a slightly closer-up view to highlight the ornaments. The numbers were purchased at Hobby Lobby, and I painted them white, stenciled a light tan herringbone pattern on them, and my husband drilled holes in them for jute twine. As you may have noticed, I love numbers, so I thought, why not on the tree? 🙂 The chalkboard balls are just inexpensive ornaments I bought at Walmart, spray-painted them with chalkboard paint, and wrote on them with white chalk pen. The darling little arrows are a new favorite. I found them at the Rebel Junk Holiday Market in Hillsboro, Oregon. They were made by the talented ladies at Roost Reimagined. The huge snowflakes tucked in here and there are from Real Deals in Salem, Oregon. I just love what they add to our sparse little beauty! Sophie made it into almost every shot. 😉 Little camera hog. On the island this year, we cut a little tiny tree at a farm just down the road from our house. I’m sure the farmer thought I was crazy, but I love this little tree. It sits in this salvaged old drawer, painted by my talented friend Anne Nash. A red berry wreath brings a little festivity to the barn door. The pops of red and fresh green are such a treat after months of dried up, crunchy wheat and such. 😉 I guess that’s what makes holiday decorating so much fun…an excuse to change things up! The dining nook is also part of this one big space, and things were kept more neutral here. Fresh greenery, buffalo check, and chalkboard. Yes. The perfect combination in my estimation. 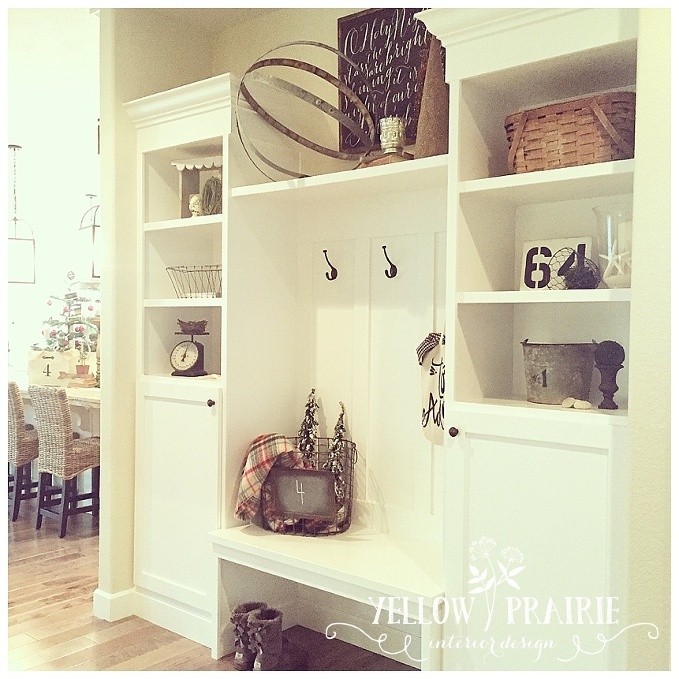 It screams cozy, humble, and casual…true love for this farm girl! The ladder in the corner is a favorite. Such a fun area to style! I love old books, and displaying them “open” gives a fresh splash of creamy white to this area. Oh, the mantel. I’ve had this old white gate out in my garage for awhile now…and when the holidays arrived, I knew it had to come inside. 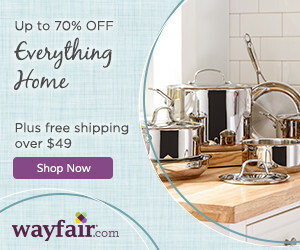 The white weathered paint, the “x” pattern…all of my favorite things! The stockings were another Hobby Lobby find. I just embellished them with a little black check fabric, some greenery, and a quick stencil job to personalize them. A pretty snowy tree in an old egg crate fills the corner without being too busy. Here’s a close-up of the arrows made by Roost Reimagined that I told you about earlier. I mean, SO CUTE! They were only $2 each. That’s a lot of fun for $2. I’m so glad you stopped by. It was a treat to have you here today and I hope you have a wonderful holiday season. Be sure to check out the next stop on the tour, the amazing Eleven Gables! Your tree is my dream tree. 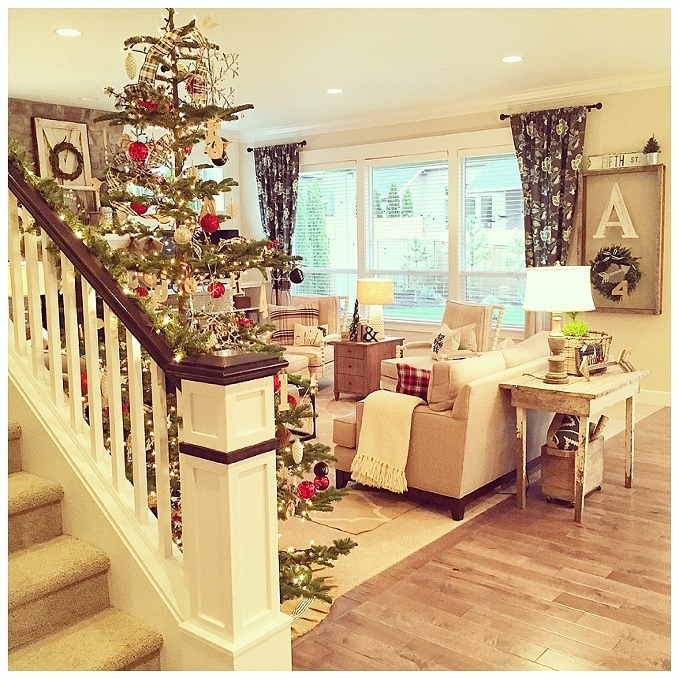 Sarah - Gorgeous home and Christmas decor! 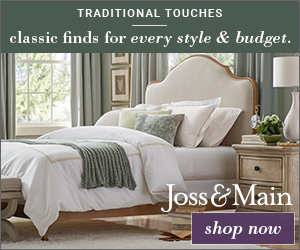 I just came across your website from Pinterest and I’m in love with your style. Can I ask where your living room sofas are from?